Sooner or later all gardeners comes to the realisation that there is nothing new in gardening. Every planting style, gardening technique and design element that becomes popular is always the reinterpretation of something that has gone before. The skill of modern designers is to make old techniques sing in a contemporary setting. The use of pleached trees, ‘hedges on stilts’, to establish the architecture of a garden is the defining aspect of 17th and 18th century design, particularly in France and Italy. Traditionally used to demarcate grand allées or to enclose intimate spaces, pleached trees had, until recently, fallen out of widespread use. Now, following their appearance in recent Chelsea Flower Show gardens, enthusiasm for them is filtering out across the country, and you can see pleached trees being landscaped into new housing schemes and for sale in large garden centres. Planting a pleached hedge has been made much easier in recent years by the availability of ready-pleached trees. Imported mainly from Italy, these are trees whose branches have already started to be trained and are tied to a bamboo frame. Even in this immature state they have an instant and dramatic impact in a garden, but, before planting them it is essential to imagine what they will be like in five, ten and twenty years time. Leave lots of space for them to grow. An imposing row of neatly-clipped trees looks beautiful, but demands work. Head Gardener David Martin looks after dozens of pleached trees at ‘Le Jardin du Batiment’ in France (the country where you will find the best examples of the technique). He estimates that a team of three expert gardeners will spend a whole week, twice a year, maintaining a run of fifty trees. Despite the work involved, it is not surprising that gardeners are rediscovering the value of pleached trees: the boldness of their architecture, their clean crisp lines in winter, their ability to provide private enclosures. Pleached trees will grow far wider than the frames, which you see them growing on in nurseries, might suggest. Planting them up against walls or close-board fences will cause difficulty in maintaining them in the future. They may look impressive as a dividing screen between you and your neighbour, but remember that you need to get all the way around them to prune. Remember too, that you will need space for ladders or platforms to reach to the top of the trees. Whether you are planning to start off with young trees or large trees that are already growing on a framework, always choose trees that have a dead straight trunk and that are all about the same girth. The advantage of growing your own pleach from scratch is that you can decide the height of the trunk. Commercially available trees nearly always have a trunk that is 2.5m tall. Young trees should have a single strong leader. Trees that have already been trained should have five to seven layers of branches. The best nurseries will have removed any branches from the trunk as soon as they appear, so there should not be any signs of large branches having been cut away. Many nurseries now sell young trees that are already trained for pleaching. Prepare planting holes that are twice the size of the trees’ root balls, and dig in lots of compost or well-rotted manure. Plant the tree with a stake that is long and strong. Don’t skip on the stakes because as well as supporting the tree they have also to support the framework that the branches will be trained against. The distance between the trees should be up to 4.5m and never less than 2.5m. The layers of the branches are usually tied in to strong bamboo poles. I have seen wire cables used. These look good in a modern garden but invariably sag and cut into the branches. Pleached lime in winter before pruning. The framework that was used to train the young trees is visible. Bend supple young shoots and tie them onto the framework. Don’t force branches that don’t want to move. It is better to cut them off and wait for more shoots. Cut back to a single bud any shoots that are growing the wrong way. Pinch back leading stems in order to encourage shoots further down the stem. When tying stems to the framework use soft string or twine, never wire or plastic ties that could cut into the wood. 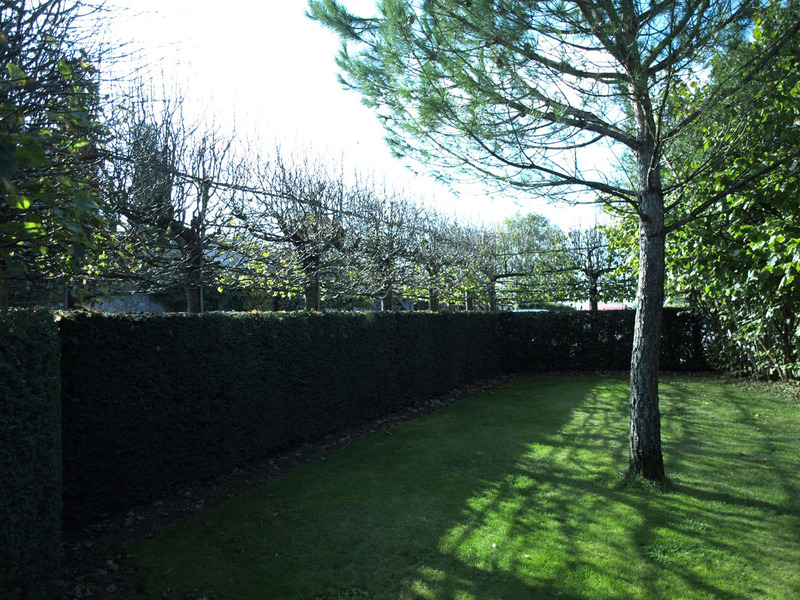 Once the trees have reached the required size and shape, they will need regular pruning to keep them that way. In November or December cut all the new growth back to the shape you want. Loosen any ties that are in danger of cutting in to the branches. Rub out any buds that appear on the trunk or main branches of the tree. An initial pruning can also be made in July to keep the trees neat through the summer. Each time the trees are pruned you should keep checking that you are pruning back to the line you want. If you have confidence in your visual judgement you can do this by eye, otherwise use a long metal ruler. At Versailles and other large gardens, a laser line is used to keep the trees perfectly square and in line. Traditionally Lime (Tilia) is used and in France the most popular cultivar, because of the red-tinge to its new growth, is Tilia platyphylos ‘Rubra’. Italian gardens tend to use a different tree, Tilia europea ‘Pallida’, which withstands drought very well. Hornbeam (Carpinus betulis) has the advantage of the vibrant lime-green colour of the new leaves and, like Beech, holds on to its dead leaves until the spring. Most trees used for pleaching are deciduous. The most successfully-pleached evergreen is Quercus ilex. 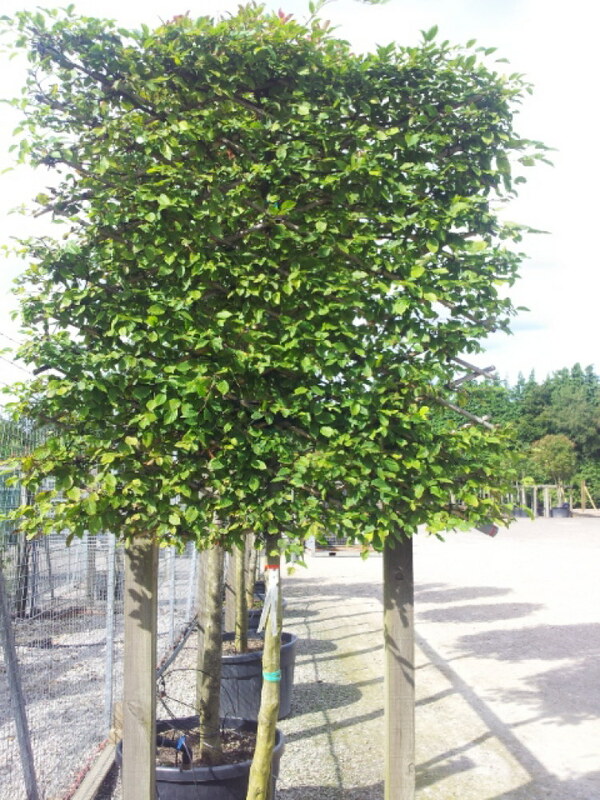 The range of pleached trees that designers and nurserymen are experimenting with is expanding. Crab apples and Photinia are common and I recently saw some beautifully pleached Gleditsia. While pleaching remains popular there will be many more nurseries trying out unusual species to pleach.